Pre-show notes: Team Geeze (Sebastian & Tom Irvin) were outside interviewing the queue for #GeeveTV on the meerkat app, inside Team SPLX, Roderick Stong and Tommaso Ciampa are all out milling round the merch tables. Started from the bottom…. 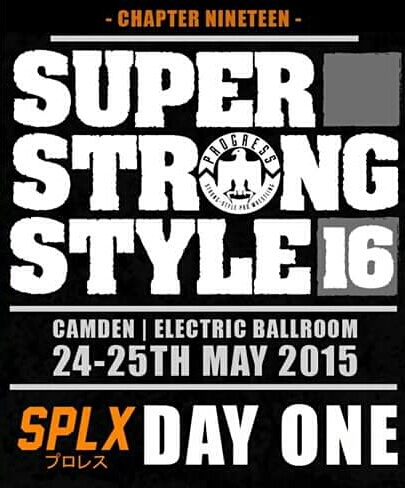 now we are LIVE at PROGRESS “Chapter 19″…. Side note: Its not often that someone out sizes or matches Rampage in the power department but Big Daddy Walter certainly can! That being said Brown picked up Walter for a samoan drop and piledriver!!! Out comes the PROGRESS Tag Team Champs, The Faceless and put a beat down on End, a third member in a suit appears and tells the masked members to remove their masks, its DAMON MOSER & DANNY GARNELL, the suited man beckons someone from the back and it’s EL LIGERO, who comes out in black, they all enter the ring and they remove the suited mans mask and its “THE SHOWSTEALER” NATHAN CRUZ!!!!! 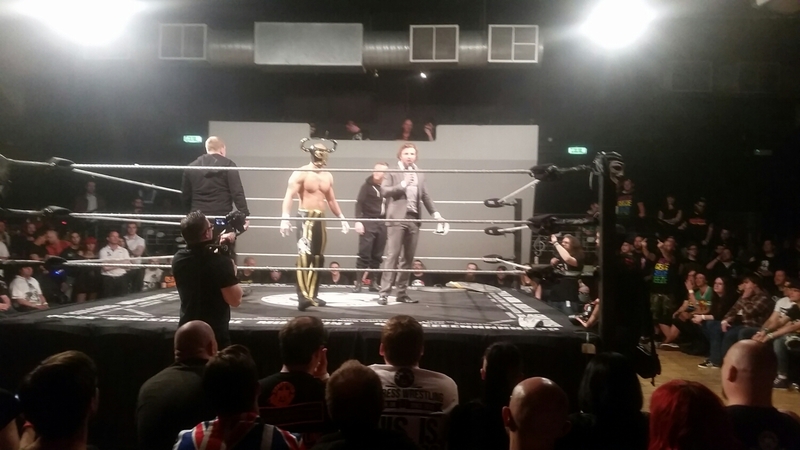 Cruz says they’ve been over looked and are the hardest working men in the UK and reminds us of each mans history in PROGRESS, the crowd chants ‘BORING!’ and Cruz says they are declaring war, not on PROGRESS, but on the fans! Cruz says the foot soliders are normally the first to fall, El Ligero kicks Garnell and then Moser joins in the attack. Cruz says The Faceless are dead and that they will now be known as The Origin and Cruz & Ligero pick up the Tag Shields as Moser walks to the back. Tommy End starts the second half with a message for The Origin, he’s just got off the phone with a friend who’s heading to the airport right now and Jom Smallman has a meeting with PROGRESS Management and tomorrow on “Part 2” it will be The Origin versus The Sumerian Death Squad for the PROGRESS Tag Team Championship! A clash of heads nearly put and end to the match, as Dar couldn’t get to his feet, Dar begs Ref Paz to continue the match, the match continued and Mastiff to attack the head and neck area. Paz eventually called for the bell and Mastiff advances. Dar was helped to the back by Glen Joseph and the ring crew. 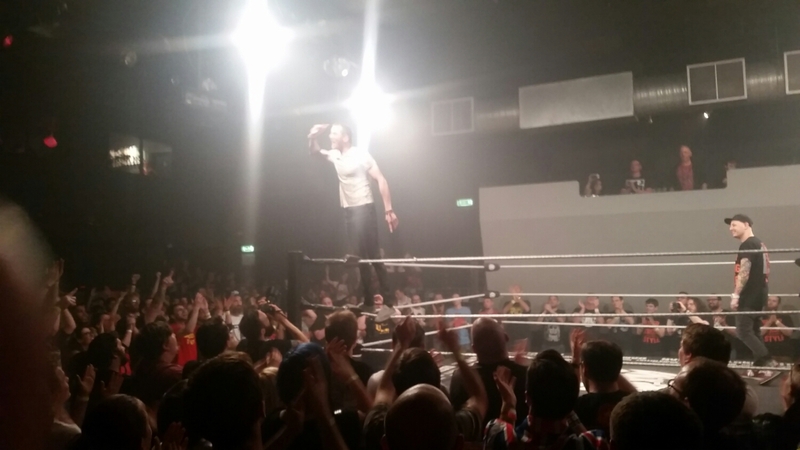 Both Ciampa & Damo embraced after the match as a great show of respect. After brawling around ringside, Havkc eventually powerbombed James Davis off the apron onto the floor and for the time being its become Rob Lynch against both members of The Regression, Davis eventually made it back to the ring but doesn’t look in good shape. Davis made a big come back taking out Havoc & Robinson, its all Riots at the moment. Some miscommunication sees Robinson kick Havoc in the Head. Davis missed a massive moonsault after Havkc rolled out of the way. Lynch reversed a roll-up lariat and delivered it to Havoc instead. Some more back and forth Havoc goes for the pin but Lynch breaks it up. Riots with a double team on Robinson, but he reversed it and delivered a low blow. All four are down and Chris Roberts start the 10 Count. Riots are up and circling Robinson until he delivers low blow, double pop up sit out powerbomb on Robinson, Pin attempt, Havoc breaks it up they hit Havoc with the GBH and the double cover seals the win.